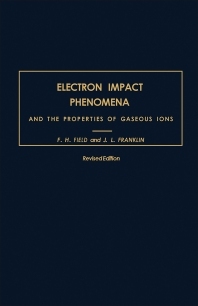 Electron Impact Phenomena and the Properties of Gaseous Ions, Revised Edition deals with data pertaining to electron impact and to molecular gaseous ionic phenomena. This book discusses electron impact phenomena in gases at low pressure that involve low-energy electrons, which result in ion formation. The text also describes the use of mass spectrometers in electron impact studies and the degree of accuracy obtained when measuring electron impact energies. This book also reviews relatively low speed electrons and the transitions that result in the ionization of the atomic system. This text then discusses diatomic molecules whose mass spectra can be interpreted using the Franck-Condon principle. This selection also presents some examples of ions in solution that resemble the gaseous ions formed by electron impacts. The energies of these gaseous ions can be the key to understanding the mechanisms of ionic reactions. These examples include the olefin addition reactions and catalytic cracking. This text will prove invaluable for research chemists, students, and professors in chemistry and related fields such as organic chemistry and electrochemistry.